You can now ask your questions about this post. Please go to the bottom of this page. The judge’s decision is final and binding and no correspondence or negotiations will be entered into. All participants agree to be bound by the competition rules. ** The competition is open to SA residents who are over 18 years of age and in possession of a valid passport, but excludes directors, employees or agents of OneDayOnly.co.za and Pentravel and their immediate families. ** The competition commences on 4th February 2019 and will terminate at midnight on 25th February 2019. No late entries will be accepted. 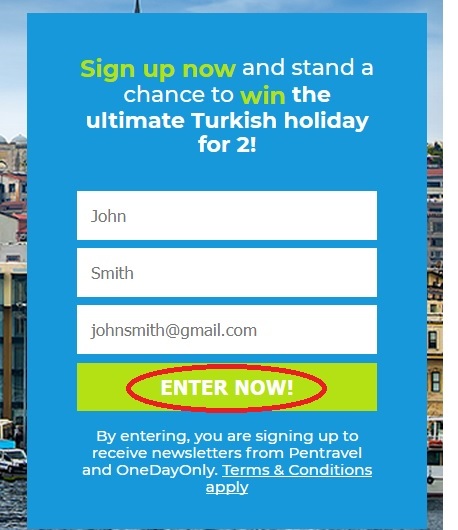 ** To stand a chance to win,entrants must subscribe and be confirmed to receive the OneDayOnly.co.za daily newsletter and agree to receive communication from Pentravel. Sign up now and stand a chance to win the ultimate Turkish holiday for 2! Step 4 : Click on Enter Now Button. Step 5 : Click Shop Onedayonly option button to purchase. ** Entry is limited to one entry per subscriber to the OneDayOnly.co.za daily newsletter.OneDayOnly.co.za reserves the right to amend competition terms and conditions at any time. ** The winner will be randomly selected by 27th of February 2019 and contacted by OneDayOnly.co.za on the email address submitted during competition entry. The winner will be required to submit valid identification before receiving the prize. If a winner cannot be contacted after 3 attempts or if sufficient identity verification is not provided, OneDayOnly.co.za reserves the right to draw a replacement winner. 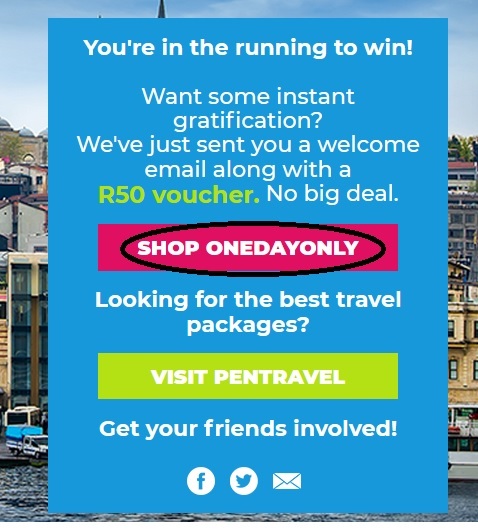 ** Winners agree that OneDayOnly.co.za may publish their name and photographic images on OneDayOnly.co.za and Pentravel’s marketing platforms including the website, newsletter and social media accounts. ** We may request the winners to participate in marketing activities for publicity purposes, but the winners may decline such invitation. How to add comment : 1) Type your comment below. 2) Type your name. 3) Post comment.